“BADLANDS” is a new album by up-and-coming singer/songwriter Halsey (with real name Ashley Frangipane). Earlier this year she was opening on tour for Imagine Dragons. Halsey was signed in 2014 when one of her songs (Ghost) gained a lot of attention online. She has since put out an EP and is now releasing her first full studio album. 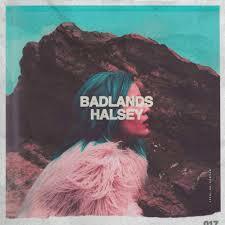 BADLANDS is a mix of electro-pop, alternative and indie pop and it’s also leaning towards some kind of dream-pop. For the fact that Halsey is still rather unknown and more “out there” than a lot of other artists, BADLANDS is surprisingly good. I personally have only known who she is for about two weeks when I discovered “New Americana” (one of the songs on the album) and she instantly caught my attention which is why I decided to make a review on her album. Overall, I would however consider this song one of the weaker ones on the album. New Americana is mid-tempo song and for me probably the best track on the album. The song features march drums in the background during most of the song. I would say New Americana is the catchiest song on the album. The song might not be quite as unique (especially in terms of its production) than a lot of other songs on the album, but that’s what makes it stand out. I absolutely loved this track from the first time i’ve heard it. Drive is a bit slower than most of the songs on BADLANDS. The song is still a stand out on the album though. Drive is intentionally a bit unstructured and with various car sounds throughout the entire song really unique and interesting. The best element in the production however is the acoustic guitar that keeps re-appearing mainly during the chorus. Even though the song isn’t even that lightly produced, this adds a nice acoustic element to the song which is, along with the car sounds, exactly why this is one of the more memorable songs when you listen through the entire album at once. The song isn’t actually all that interesting, so it’s no surprise i almost forgot it when writing this review. But even so, the song is actually kind of… cute? It’s one of the more happy moments on the album and definitely a good break from all the heavy lyrics. But still, one of the weaker tracks. It’s also, from what i’ve heard so far, one of the fan favorites. This is a beautiful song that has the ability to make you enter a dream world when you listen to it. Colors is really enjoyable to listen to and definitely one of the best songs on the album. Coming Down is another one of these tracks that get lost a bit. I don’t even have a lot to say about this song… it’s just there. The acoustic guitar is really nice though… but yeah, it’s kind of a filler. Another track that could be a Tove Lo song. Haunting is mid-tempo but still pretty rhythmic with a nice and steady beat throughout the entire song. The verses aren’t very memorable but the chorus is actually really good. This is what Halsey sings in the chorus followed with several repetitions of “I’m begging you to keep on haunting (me)”. The song is actually not as “haunting” as you’d think, it’s more of a love song. The chorus really saves this song from being completely forgettable, so overall i would say it’s still a solid song. I turned all the mirrors around”, talking about another “person” being in her mind. Meanwhile the inside is put on the outside aswell and she can’t stand to look at the person inside her or the person she herself has become so she has to turn the mirrors around. Of course this is just one interpretation and I don’t know whether Halsey wrote this with herself in mind or just wanted to capture a specific emotion, but i do feel like this song is really open for interpretation to anyone and everyone is probably going to see it differently. All of this makes the song extremely haunting and captivating and what it does really well is make the lyrics count for something. They’re not just lyrics that are just there, Halsey really makes you think about what these lyrics are about. Young God is another good track, even though it’s probably more in the middle field overall. Again, I don’t really have a lot to say about this song. Ghost is a electronic influenced mid-tempo song and possibly one of the most “mainstream” songs on the album. The song is, along with Colors, one of the better examples of dream-pop. The reason for this is mostly the production and the way the melody is composed, but of course the lyrics are important aswell. Compared to the rest of the album Ghost is actually sort of uptempo, even though it’s not super fast, which is also kind of surprising because the first 15 or something seconds make you think the song is a ballad. And now on to the Deluxe tracks. Probably the track with the heaviest production on the album, and it’s awesome! The song starts with some sort of string instrument, it sounds like a banjo actually. The verses are still rather calm compared to what’s coming in the chorus. “Are you insane like me? Been in pain like me? Bought a hundred dollar bottle of champagne like me?” Halsey sings in Gasoline, followed by some explicit lyrics which we will not go in detail at this point. Each line in the verse ends with “like me” as a rhetorical device to put emphasis on the last words. I believe this is what we would call an Epistrophe (which is Greek for “return”) or Antistrophe. You might know it as epiphora (so basically the opposite of anaphora, the technique of having the same words at the beginning of each phrase). This makes the listener extremely aware of the lyrics and it’s a good thing. I Walk The Line is a ballad, however it is still pretty mid-tempo. Although, since everything is kind of mid tempo in this album this does feel like a slow song. The song is also one of the only songs to have a noticeable piano in the background, which is definitely nice! Overall, this is actually a really good album. As a total score I would give it a 8/10, which is definitely a great score. The album is definitely coherent, but sometimes the overwhelming amount of mid-tempos on the album makes the lines between the songs really blurry so they seem less distinct. I really wish she had at least one completely untouched acoustic ballad, Halsey actually seems to have really good vocals so that would be a way for her to show them off. All in all this could end up being one of the best albums released this year, which is amazing for a new artist like Halsey. She’s also growing fast in popularity, so i really do think this album will kickstart her career! Good Luck! What did you think of BADLANDS? Share your thoughts in the comment section below. ← Lineup for the 2015 MTV VMA’s announced!